Here at Holmdel, a Chinese Herbal Medicine Center and NJ acupuncture treatment facility, we are a small group of well-trained, very experienced, dedicated professional NJ acupuncture and holistic doctors who strongly believe in the wholesomeness of each individual and the inseparable unity between spiritual, emotional, and physical health. We also believe in the energy communication between acupuncturists and patients. As you enter our New Jersey Herbal Medicine Center, you will surely feel the relaxing and healing energy in the office and you will find each one of us compassionate, sincere, knowledgeable, professional, and skillful. We have only one intention and that is to make you feel better, healthier, happier and well balanced. We have treated almost all health conditions from allergy, stress, sinusitis, headache, IBS, back pain to infertility and cancer (conjunctive therapy) with great success. The fact that more than 80% of our new patients come from referral each year speaks of our service on its own. Our great success in treating infertility with acupuncture and Chinese medicine is strongly evidenced by our rapidly growing baby gallery and very high success rate. 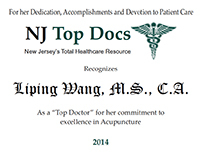 As a five year recipient of the “New Jersey Top Docs” award for 2012, 2013, 2014, 2015, and 2016, We are proud to be referred as one of the best acupuncture centers in Monmouth County and Ocean County of New Jersey. We are very confident that you’ve chosen the best acupuncture center, one that you and your family can trust for many years to come. Liping received her Traditional Chinese Medicine training in Shandong China. She received BS degree in Chinese Herbal Medicine in 1990. After finishing her studies she worked in the Division of Traditional Chinese Medicine, Hua Qing Hospital in China for two years. Liping came to the United States in 1992 where she worked at a holistic clinic in New York City. In 1998 Liping returned to Shanghai, China for advanced clinical training in acupuncture at Shuguang Chinese Medicine Hospital. During this training, Liping was treating over 100 patients with various health conditions every day. 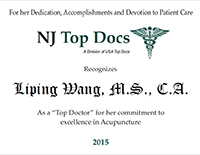 In 2000 Liping received her MS degree in Acupuncture from the New York College for Holistic Health, Education and Research. 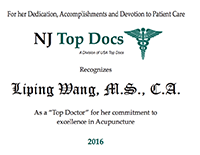 Eager to help many that needed her expertise here in New Jersey, she opened “Holmdel Acupuncture & Herbal Medicine Center” in 2001. Her practice includes acupuncture, Chinese herbs, tai chi, chi gong and tui na. Liping is licensed in both New York and New Jersey. Liping is a member of the Acupuncture and Oriental Medicine Alliance. She is also a member of Holistic Healing. Chi received her Master’s Degree in Oriental Medicine in 1998 from Pacific College of Oriental Medicine. She also interned at the Beijing International Acupuncture Training Center, a World Health Organization (WHO) center for Traditional Chinese Medicine with seventeen hospitals in Beijing China. She is Nationally Board Certified and licensed to practice in New York & New Jersey. Jason received his Master’s Degree in Oriental Medicine in 2004 from Pacific College of Oriental Medicine. He also apprenticed with Dr. Nan Lu, a leading acupuncturist in New York, for four years. Jason is Nationally Board Certified and licensed to practice in New Jersey. Shi Qi (CK) was a well trained professional massage therapist before he received training in acupuncture. He graduated from Pacific College of Oriental Medicine with a master’s degree in Acupuncuture and Oriental Medicine in 2011. While training in school, he actively apprenticed for many years from acupuncturist and herbalist at Zhong Guo Yao Chai Inc. He has license in both New York and New Jersey States and has worked in Brooklyn, New York, and New Jersey. Heather graduated from Somerset School of Massage in 2004. She is an experienced massage therapist and Reiki master specializing in the sports and rehabilitative support, prenatal, intuitive massage, Swedish, and massage for those with life-changing illness. She integrates both massage and Reiki to compliment acupuncuture, chiropractic, and hospice care. Heather also utilizes massage and a variety of stretching styles to assist in maximizing body’s performance and support maximum recovery from injury. Heather Dalton is available to educate groups or individuals on techniques for grounding and self soothing, Reiki for self care (level 1), and to speak on the benefit of massage. Heather’s B.S.from Penn State in Architectural Engineering launched her interest and talent in discovering “how things work”, when combined with her compassion for others, led her to her love of massage. An energy intuitive, she has been studying and practicing Reiki since 2005. Aura D’Amato is an experienced certified reflexologist, energy healing practitioner, angel communicator and inspirational speaker. She holds a bachelor’s degree in sociology and is a graduate of The New Jersey Institute of Reflexology. Aura is dedicated to sharing a holistic approach to healing and well-being that entails looking at the whole person – the body, the mind, and the spirit – with the understanding that they are interconnected and each plays a part in our health, well-being and abundance. Through her Angels Guided Healing work Aura calls upon Divine guidance and the assistance of angels to assist and guide her, and to share angelic messages for love and healing to go forth. Aura has had a loving dialogue and connection with angels for many years. Aura offers Angels Guided Healing sessions, which can integrate reflexology and energy healing. Aura calls forth Divine intervention that can open up the possibility for more choices, improved health, joy, success in living, and awareness on how to access all the answers that are within you. Aura is the author of the book Angels Share The Power Of I Love Me and How It Can Change Your Life and the World. Her recently published book is now available worldwide. In this book, Aura shares the angelic message of the power of “I Love Me” and how it can change your life and the world. These angelic messages are given to bring all people to the understanding of the loving presence and power of God within them and the awareness of angelic power in their life. It is Aura’s passion to share these angelic messages to empower people and to encourage all people to seek companionship with their angels. Aura is a member of the Reflexology Association of America, the Associated Bodywork and Massage Professionals, The National Association of Professional Women and The Wellness Universe. She has taught reflexology and energy healing to nurses as part of a team of nationally distinguished faculty and practitioners. Aura is available to educate groups on reflexology techniques and to speak on the benefits of a holistic approach to healing. She also offers Angels Guided group healing sessions.